My interest in photography started late 2003, with a plastic toy camera called a Cybersampler. By December of the same year, I bought myself a Lomo Lubitel 166B, a twin lens reflex camera I ordered from Russia. It was just the first of the dozen-or-so Soviet-era vintage cameras and accessories I acquired. Cheap, but elegant, and very useful things. 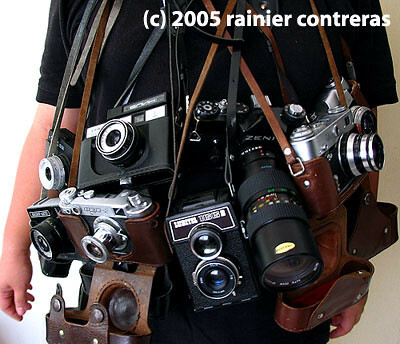 I actively used a few rangefinders, an 80s era SLR, and a capable Canon A85 whenever possible, until early 2006. While working in Shanghai, China, I spent three months of hard-earned, OFW-generated money on a Canon 350D DSLR camera, which are sometimes adapted to my Russian lenses. I haven’t let go of this toy since. I’ve co-founded the now defunct Litratista.org late 2005, a group photography website, addressing the beginner, and novice/hobbyist photographers. Around the same time, I started moderating the ToyKameraPilipinas mailing list, which has since evolved also into Rangefinder Filipinas, a local group of rangefinder camera enthusiasts. The collective is now located at rangefinderfilipinas.com, and rightfully self-touted as the “first and only classic photography community in the Philippines“. I have created and currently administer and develop the website. My photo gallery online is over at Flickr. I was contacted via email of the Chinese Museum’s interest in some of my Chinatown photos in Flickr, and was invited to submit entries for the exhibit. I did, and four of the five photos were chosen. For related blog entry, click here. A photo exhibit with my photography/camera group, Rangefinder Filipinas. Proceeds benefit the Remedios Training Center and the street children of Malate. For related blog entries, click here, and here. Organized by the Flickr Philippines aka Flickrista group. Sold my first photo there. Some of my photos taken of band gigs have been published at local magazines, namely Preview and Manifesto. I have also been published in the book China: A Visual Adventure (Carlton Books [UK]/National Geographic [Germany]), as well as Cebu Pacific’s inflight Smile magazine. If you are interested in hiring me as photographer, or you would like to use any of my images, please submit your details using this contact form.